Something to always keep in mind is the particularly changeable weather of the area. It's said that in Patagonia you can experience the four seasons in one day, so always carry adequate clothing and something to eat and drink. It is very important to protect yourself from the sun, as it is very strong here, being in close proximity to the ozone hole. Use sun block, sun glasses, etc even on cloudy days. The first of the traditional trails, and probably the most popular one. Leave the town and head north into the park with a medium difficulty section at the beginning until you arrive at a fork in the trail, roughly 1:30 hs from the town. To the left the trail will take you to Laguna Capri, a small lake in the mountains, surrounded with lengas and ñires were you will be able to see Cerro Fitz Roy. 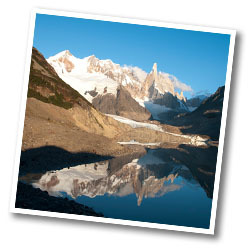 To the right, the trail takes you to the Fitz Roy viewpoint, for a panoramic view of the mountains around Cerro Fitzroy. Continuing on the trail it will merge again, until you get to Campamento Poincenot and then Rio Blanco. Cross a wooden bridge and from there, the trail gets steeper as yo start to climb in a zigzag,to 500m. At the top you have a stunning view and will be able to see Laguna de los Tres with its electric blue waters and the face of Cerro Fitz Roy and its glaciers. Return to Chalten on the same path. Total return distance is 24 km and will take between 8 and 10 hrs. The total ascent is around 770 m.
An alternative one way hike is to walk from Hosteria El Pilar, located 17 km from town, by minibus transfer. 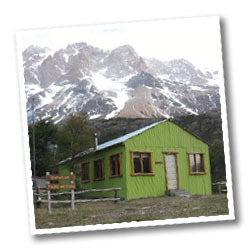 Once there, the trail follows Rio Blanco southwards until you get to Campamento Poincenot, passing though the Piedras Blancas glacier viewpoint. 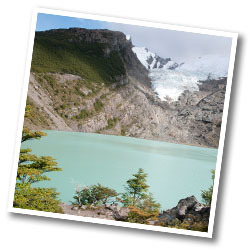 From there, the trail is the same as before, up to Laguna de los Tres, or return to El Chalten. The advantage is that the trail is a little easier and you don't walk it twice. 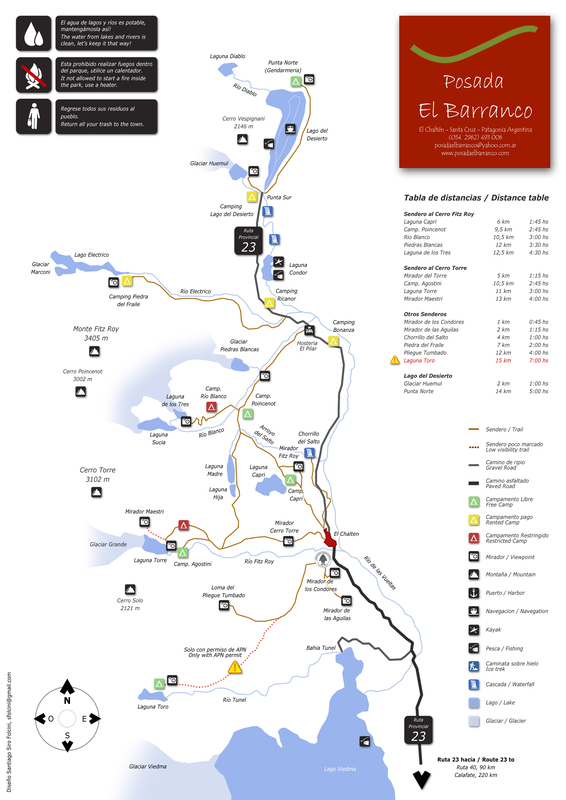 The total distance from Hosteria El Pilar to El Chalten, including Laguna de los Tres is 20 km, and takes between 7 and 9 hrs. The total ascent is around 650 m.
This is the second of the traditional trails and one of the most simple to do. We leave the town and head west into the park with a medium difficulty section. Roughly 1:30 hrs from town you arrive at the Cerro Torre viewpoint, to get your first good look at Cerro Torre, Cerro Solo and the Grande glacier among others. Continuing along the trail heading west to the Fitz Roy river, which will accompany you all the way to Campamento Agostini, and then to Laguna Torre. Once there you can continue a little more to the Maestri viewpoint were you will get a better view of the glacier. The total to walk is 20 km to the Lake and it will take between 6 and 8 hrs. 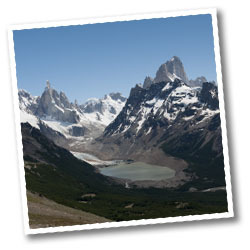 The total ascent is 250 m.
To get to the Maestri viewpoint, continue to the right (looking at Cerro Torre), along the edge of the lake following one of the many trails that go to the top. Once there, all the trails merge into a single one that will take you to the viewpoint. Total return distance from the lake is 4 km and takes 2 hrs. The total ascent is 100 m.
One of the least traveled trails, but maybe one of the best is the trail to Pliegue Tumbado, which starts at the APN office in the south entrance of town. With a medium difficulty all the way, the trail ends in the highest viewpoint in the park, but because its distributed along the way, its easier than Laguna de los Tres. You climb steadily through a forest of lengas and ñires (Patagonian Beech trees), following creeks until you get to a fork in the trail. Going left you get to Laguna Toro (only with APN authorization), so continue to the right for Pliegue Tumbado. Leaving the forest for the last hour you'll cross a shingle scree were you'll find ocean shell fossils from when the Andes were formed. After the last incline you'll get to the end of the trail and the viewpoint where you get a magnificent view of all the major peaks in the park. In front we will have Cerro Torre and Laguna Torre, Cerro Fitz Roy and Poincenot Needle, Laguna Capri and even Laguna Condor, located 20 km away from us. After a well deserved rest, we return following the same path, looking down on Lake Viedma. Total return distance from the APN office is 24 km, and will take between 8 and 10 hs. 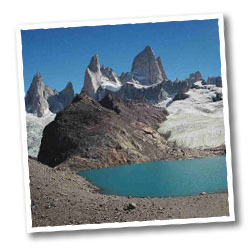 The total ascent is1000 m.
Lago del Desierto is located at the end of route 23, some 37 km to the north of El Chalten. With emerald green waters and surrounded with thick forests on one side and the Vespignani hanging glacier, Lago del Desierto offers a unique landscape. 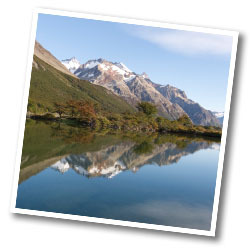 Once at the lake, you can take a boat to the other point or walk to the Huemul glacier viewpoint. If you walk to the viewpoint, you'll start at the parking lot by the edge of the lake and then follow an easy trail that climbs the mountain following the Huemul river. The trail is short, but some parts are steep and the loose ground complicates things a little. Once on the top, you will find yourself at the edge of Laguna Huemul and be able to see the glacier on the other side of the lake. You also have a panoramic view of Lago del Desierto. Total walking distance is 4 km and takes around 2 hrs. The total ascent is 200 m.
One of the easiest trails, ideal for those wanting a rest day or for those with little time in the area. This trail can be done on foot, bike or by car. Follow route 23 (gravel) to the north along the edge of Rio de las Vueltas. Along the way you'll find a small trail for those on foot that will allow you to avoid the dust from the cars. From there its only 2 km to the waterfall. 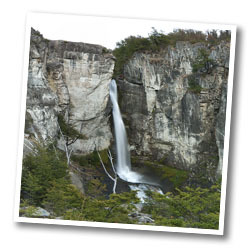 The chorrillo is a 20 m high waterfall formed by the Salto river, which comes from Laguna de la Madre. Surrounded in a thick forest, it is an ideal place to rest or have a picnic lunch. Total return distance from town is 8 km and will take between 2 and 3 hrs. The total ascent is only 50 m.
Another easy trail, this one also starts from the APN office at the entrance south of the town. Both trails start together following an easy climb along the side of a hill, arriving at a fork after 30 minutes. To the left continue to the Condores viewpoint, only 15 minutes away. 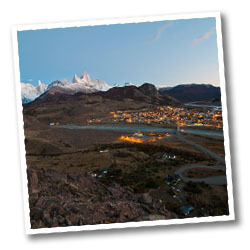 Once on the top you can see the whole town and the mountains in the area, including Cerro Torre and Cerro Fitz Roy. With a little luck you will be able to see a condor because they use the thermal currents in the area to gain elevation. Total return distance from the APN office is 2 km and takes 2 hrs. The total ascent is 50 m.
The right hand fork takes you to the Aguilas viewpoint, located 45 minutes away. From there you can see route 23, the estepa and Lago Viedma. To your left, crossing Rio de las Vueltas you can see Cerro Piramide. Total return distance from the APN office is 4 km and takes 3 hrs. The total ascent is 50 m.
This trail connects camp Poincenot and camp De Agostini (near Laguna Torre) so its mostly used by back packers going from one camp to the other. Leaving from Poincenot, take the trail heading to El Chalten until you arrive to Arroyo del Salto where you will find a slip in the road. To the right, you go to Laguna Madre y la Hija and then all the way to Laguna Torre. 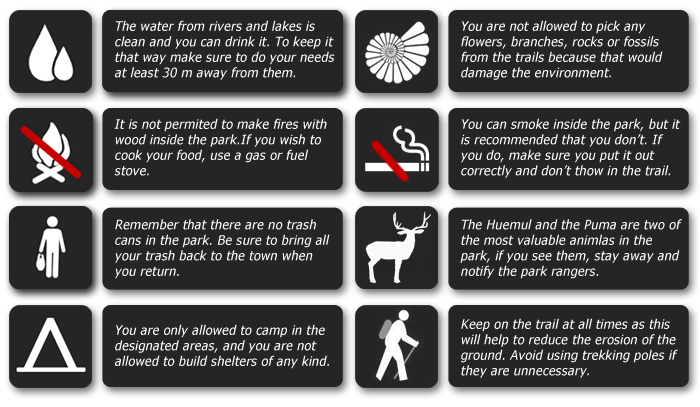 If you are not going to stay the night in one of the camps, it is best to avoid this trail as it would take too long for a single day. The total distance between the camps will be 11 km and takes 3 hrs. The total ascent is around 100 m.
The trail to Piedra del Fraile is another good option for an easy trail. The start is on route 23, 20 km from the town on the way to Lago del Desierto, and right next to the bridge that crosses Rio Electrico. It follows the river along most of the way, and it will takes you along a thick lenga forest until you arrive at the refuge located right next to the river. If you continue, you can get to Paso Marconi and Paso del Cuadrado, but keep in mind that both trails are quite hard and require a local guide. The total return distance from the road to the refuge is 12 km and takes 5 hrs.